Tasty tartlets with pineapple, cashews and maca. You can buy the ingredients listed in the recipe. Soak the cashews overnight in water. Chop pineapples and dates into small pieces and create a sticky mass. If the fruits are not sticky enough you might want to moist your hands and compress the mass. Cover small round tins with baking paper and press the pineapple-date-dough into the tins. Place it somewhere cool. Puree soaked cashews in your mixer, peel the orange, chop it into small pieces and puree it together with the cashews. Add maca, agave syrup, coconut oil and salt. Puree your ingredients again. Now your tartlet cream is ready! Put the cream on top of the cooled dough and smooth it down. Put it in the freezer for a couple of hours to set. 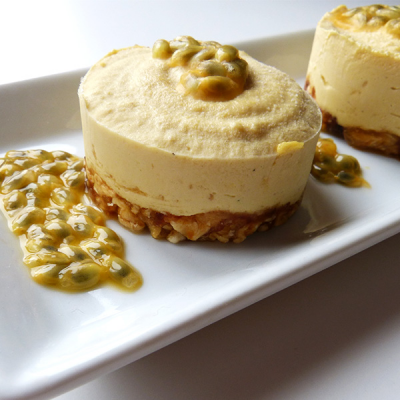 Finally serve your fruity tartlets with pulp of passion fruit. The given amount serves 1 – 2 people. I agree with receiving your newsletter and business messages. We take care to protect your personal data and process them in accordance with the General EU Data Protection Regulation 2016/679 (hereinafter referred to as GDPR). We only process common personal information that you filled in when registering to the e-shop. Namely, your name, surname, e-mail, phone number, billing details, delivery address and order history. We need this information in order to conclude the business transaction and ensure delivery of the goods. This is therefore a legitimate reason for the retention of data for the statutory period (Article 6 (1) b) and c) GDPR or Article 6 (1) a) GDPR when agreeing to receive newsletters - business messages). We do not collect or process data that falls under the category of sensitive personal information. Registration to the e-shop as well as a separate subscription to the newsletter are linked to the e-mail address. To avoid unauthorized registrations of your email addresses by strangers or robots, an email with a double-opt-in link will always be sent to you. All data is either by ourselves or through our contractual agents, bound by the Personal Data Processing Agreement and technical security guarantees that correspond to the GDPR regulation. No automated processing, including profiling, is used in our data processing. We process personal data for our own purposes and your personal data is never passed on to other recipients. By checking the box marked “I agree to the processing of personal data for the purpose of ... (such as sending a newsletter)” via the online form, you voluntarily agree to the processing of personal data for the given purpose (such as sending a newsletter) and accept these terms and conditions of personal data protection. Your consent to the processing of personal data is valid until you withdraw it. However, you can withdraw it at any time in your profile settings or by clicking on the link contained in each newsletter - business message. The wording of the consent and privacy terms is stored at the time of your consent. If we change the wording of the consent or conditions in a legally significant way, you will be notified of this and have the possibility of renewing or withdrawing consent. According to the GDPR, you have the right to access data (GDPR Article 15) that we collect about you. This is ensured by (a) the possibility of inspecting your own profile (if you are a registered user), or (b) by asking the administrator (contact listed below) for a listing of your data. When using option b), in order to protect your data from abuse, you must contact us from your personal email, or prove in another way your right to access the data. Furthermore, you have the right to correct and rectify your data (Article 16 GDPR), to delete them in legally possible cases (Article 17 GDPR), to restrict processing (Article 18 GDPR), to object to processing (Article 21 GDPR), to transfer your personal data to another controller (Article 20 GDPR). You also have the right to file a complaint with a supervisory authority if there is a reasonable suspicion that your right to the protection of personal data has been violated. The administrator declares that he has prepared a risk analysis and secured the processed data in a way that complies with the requirements of the GDPR regulation. Only authorized persons come into contact with personal data. The administrator has contracts with the sub-processors of personal data (such as hosting, mailing) for the purpose of processing personal data. Administrator: Lifefood Czech Republic s.r.o., registered office: Škrétova 45/8, Prague 2, 120 00, ID: 27437485, registered in the Commercial Register maintained by the Municipal Court in Prague, Section C, Insert No. 111974. You can contact the administrator by phone or e-mail, for more info visit the Contacts section on our website.